This page lets you configure the settings for sending via an external SMTP server/smarthost. 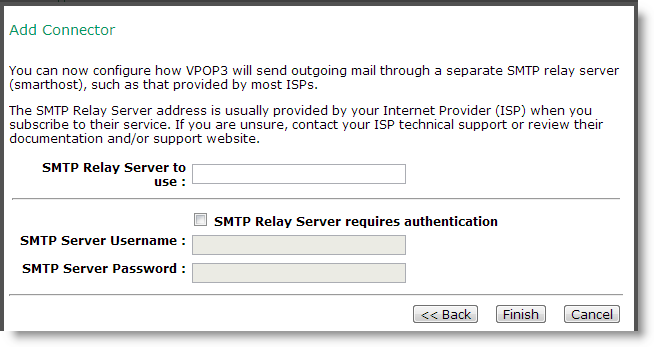 The SMTP Relay Server to use option lets you set the address of the relay server to use. By default VPOP3 will send to the specified server using TCP port 25, and without using SSL encryption. You can specify alternate ports or encryption in the settings later. If the SMTP relay server you will be using requires you to log in before sending messages, then check the SMTP Relay Server requires authentication box, and enter the username and password into the SMTP Server Username and SMTP Server Password boxes.All this information should be obtained from your Internet provider (note that they may use the term Account or Mailbox instead of Username - the terms are equivalent). Press Finish to create the new Connection and Mail Sender.